The Civil Defense Siren was first conceived of during World War II following the attack on Pearl Harbor, but the number of sirens and siren systems in most cities spread much more rapidly during the Cold War. Federally distributed pamphlets and films, aimed at educating both adults and children, would spread the word of what to do in case of an alert. Although siren systems were typically controlled by local governments or police departments, the sirens were built by outside companies with a vested interest in increasing sales. Sales brochures often illustrate the efforts to make money, and the influence of previous warfare on the development of such warning systems. 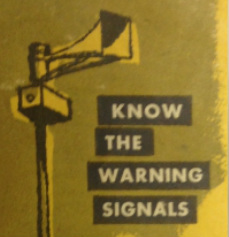 While the hypothetical image of nuclear war often followed from early bombing techniques of WWII, Cold War warning systems manufacturers had to contend with the development of military technology. Early warning and defense systems built as responses to bomber planes could spot potential threats hours before they were actually in the position to drop their bombs. While defensive systems like the Nike Ajax and Hercules missiles had been developed to defend against such scenarios, with the introduction of Intercontinental Ballistic Missiles, such short range defenses not only became obsolete, but the window to warn entire populations dwindled to a matter of minutes. The Attack signal sounds only in case of enemy attack. The signal is a 3- to 5-minute wavering sound, or short blasts on whistles, horns of other devices. The attack signal means that an actual enemy attack against the United States has been detected, and that protective action should be taken immediately. The Alert signal (or Attention signal) is used by local governments to get the attention of citizens in a time of impending natural disaster or peacetime emergency. The signal is a 3- to 5-minute steady blast. Like many aspects of the Cold War, Civil Defense Sirens became part of peoples daily lives. In Los Angeles, sirens were tested in unison at 10 a.m. on the last Friday of every month. Typically placed atop tall fire stations or attached to 30-foot steel poles, residents would hear a loud blast from the sirens; an experience many still talk about today. Many websites, discussion boards, and groups exist online that have constructed a greater body of information about "Siren Hunting" in major cities across the nation. The map to the right, created by Siren Hunter Dennis Hanley, displays the location of sirens throughout L.A. and San Fernando Valley. During the war, Civil Defense officials often used the analogy of natural disasters to understand and educate the public about the dangers associated with nuclear detonation. Early analogies framed the destructive potential within familiar language related to natural disasters like hurricanes or tornadoes. With the immediacy of a missile attack, the use of such analogies eventually centered on earthquakes in order to communicate the unpredictability of a nuclear attack, and the difficulty of any advanced warning. Following the war, this connection to nature came full-circle as these siren systems were re-purposed in many areas of the country to warn people of weather related dangers (ex. tornadoes, hurricanes, etc.). Because of their continued use, sirens in other cities are often maintained, or replaced. In Los Angeles, a region quite effected by earthquakes, the analogy first established between the war and nature continues. Having no other purpose, sirens decay on top of poles throughout the city. Suffering from neglect, the sirens in L.A. have faded into the palimpsest of the city. Stripped of their paint, the sirens remain hidden amongst palm trees and skyscrapers. Federal Model 5 has a cylindrical-shaped sheet-metal housing with a conical dome on top and truncated cowling about one-third between the bottom and top of the housing. 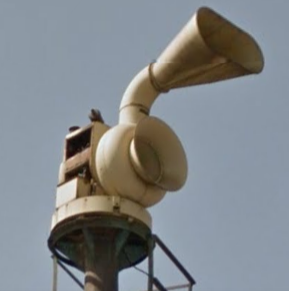 Nicknamed the "birdhouse" these sirens come in four types of units: model 5A, 5B, 5AT (dual tone) and 5BT (dual tone). The units are 41 inches in diameter and 52 inches in height and weigh 395 to 410 pounds. It has 12 ports, and could produce a sound level of 113 decibels in a frequency slightly below an F note. The sirens produce this tone through a screened air intake in the side of the housing, which prevents objects from entering. ACA Allertor 125 was made by Alerting Communicators of America from 1944 until 1980. It has a highly recognizable design with air entering the chopper in the bottom horn and the noise coming out of the top horn. Despite being an efficient design, it was expensive to build the fiberglass horn. The Allertor was finally discontinued around 1980. Although it was a popular choice particularly in the Midwest, there are only a few examples in the greater Los Angeles area. Federal Model 500T is the 10 HP dual-tone version of the Federal Model 500, which was first conceived from a rotating–horizontal Model 5, hence its nickname "rotating". It was introduced in 1954 to fit Civil Defense standards for dual-tone sirens. Around 1960, the design was improved, with a longer projection dish and an improved motor cover. The siren's dual tone ratio changed over time switching back and forth between a non-harmonic minor 3rd and 4th interval. The 500T was produced by Federal Sign and Signal Corp. until 1981. Federal Model SD-10, also known as the "wire spool" because of its resemblance, is one of the most common sirens throughout the city. It was introduced in the early-mid 1950s as a dual-tone air raid warning signal. It was marketed as a "double tone version of Federal's STL-10 siren". A partial list of its features includes not only its dual-tone design, and protective housing, but also an increased output, a more effective inverted design, and a simplified mounting. Federal Thunderbolt was the siren of choice by many Civil Defense authorities and emergency management agencies from the early 1950's through the late 1970's. Built by Federal Signal, the Thunderbolt was introduced in 1952 during the beginning of Cold War tensions as primarily an attack warning siren. With the discontinuation of federal matching funds for civil defense equipment, the sales of the Thunderbolt siren declined since it was a very expensive siren to purchase. Federal Signal phased out the Thunderbolt series by 1990. Of all the sirens produced during the Cold War era, the Thunderbolt has the most distinctive and recognizable design. This was so apparent to the manufacturer that an early advertising brochure stated, "When you notice a Civil Defense siren ten-to-one it's a THUNDERBOLT". 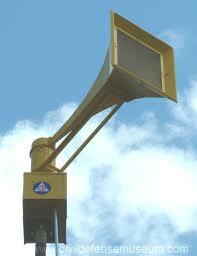 Chrysler Air Raid Siren was the second generation air raid siren produced by Chrysler from 1952-1957. Its six horns were each 3 feet long, and powered by the newly designed HEMI engine. The siren weighed close to 3 tons, and could be heard from a distance 25 miles. The Chrysler air raid siren produced the loudest sound ever achieved by an air raid siren. A reported 24 sirens were placed around Los Angeles County, but many were removed or are non-operational. VictorySiren.com is dedicated to the history of this particular siren, and has several locations and images of the siren around Los Angeles. Check out our siren project! Check out the Daffodil Metamorphosis.